Allergic To Your Air Conditioning System? 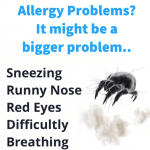 Is Your Air Conditioning System Causing your Allergies? After a good few months of sun, London has been hit with a cold and rainy patch. The recent use of your air conditioning system to maintain that artic environment inside while everyone roasts and melts on the streets has likely clogged the filters with dust, pollen and allergens. If you fail to service your system regularly, your filters become the ideal environments for dust mites to multiply. If you suffer with asthma or hay fever, using an air conditioning system can actually help your allergies. The containments in the air get trapped in the filter as part of the cooling cycle. However if your system isn’t maintained the intended benefit of the filter can actually become the problem. Be sure to service your unit all year round. Why? Measuring less than a millimetre, they can’t be seen by eye. Dust mites breed in conditions with warmth and high humidity. Additionally, while the system is off and clogged up, up to 13 species of these irritants are secreting droppings every day. Furthermore, dust mites can even cause allergic reactions when they have died as their bodies decompose. Suffering? If you have been sneezing with a runny nose? Have itchy skin and chest pain? Watery eyes, rashes or even trouble sleeping dust mites in your air condoning could be the problem. First and foremost, look at reducing the humidity in your space, if you have high humidity your air conditioning system may be incorrectly specified or you may need to retrofit a ventilation solution. Call a HVAC specialist to check over your system, or start using a dehumidifier to treat the moisture in the air. What about your air conditioning system? Before you press the on bottom during the next wave of heat, make sure you take the filter out of your system and give it a good wash. Not sure how to do it? Check out our DIY how to service our air condoning system guide on Youtube. Aside from cleaning your air conditioning system regularly or updating you old air conditioning system, the NHS also recommend over the counter treatments such as oral Antihistamines. Furthermore, make sure you regularly wash all you bed linens and towels. 0 comments on Allergic To Your Air Conditioning System?